All parents want their children to succeed, yet we sometimes place a stumbling block in the way of successful potty training. In order to be successful, we need to look at the issue from the child's point of view, and train according to his pace. Parents need take into account the child's physical and psychological readiness and think about other issues that could set him up for failure. For example, is your family getting ready to move into a new home? Is Mom about to give birth, or is there already a new brother or sister at home? All of these myriad factors need to be looked at and dealt with or we risk a vicious cycle that ends with potty training resistance. In general, it's normal for children to regress in potty training, but children who are still not trained by the age of 3-3 1/2 years old are considered potty training resistant. In younger children, when a trial run of potty training fails, parents should give things a rest and wait a few months before trying again, but at the age of 3 or so, a child resistant to potty training is not showing a lack of readiness and you'll need to change tactics. Power struggle between child and parents--wielding control over bowel movements and urination is heady stuff for your child. Negative attention for being dirty and wet is better than not enough attention. He may like this type of attention from you. Though unusual, there are medical conditions that can cause an inability to control urination and bowel movements, so it's a good idea for your child to have a checkup if things don't go well. If things check out at the doctor's office, let your child be responsible for his own toilet habits. If he fails, he fails, and don't let anyone try to make you feel guilty about the way you handle things. 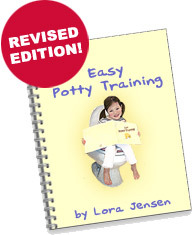 This is the best way to remove toilet training as a difficult issue for your child.